Take note Galaxy Note II owners as the multi-window software update started rolling out early this morning bringing multitasking goodness along with it. The update, which is available Over The Air (OTA) and through Samsung’s Kies software adds multiscreen functionality, along with several bug fixes. 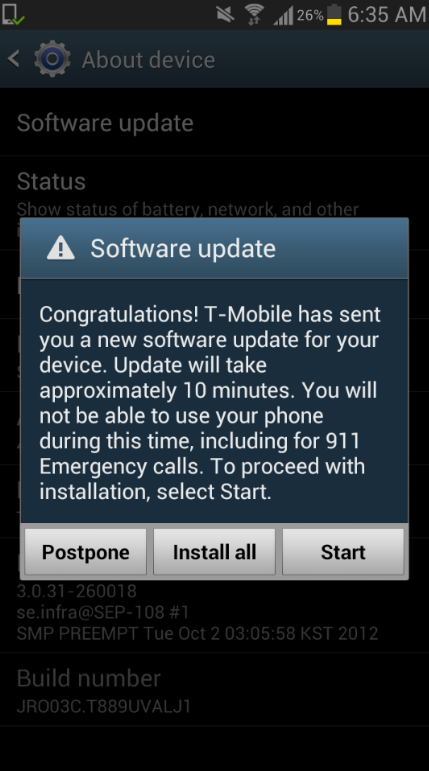 Galaxy Note II units will be updated to Android version 4.1.1/T889UVALK8. never mind , it was available in software updates in settings. I’m having this same issue! Dang it! No issues and works like a charm, very nice. Got it last night thru Kies. Works great! Everyone has the update….no one will answer my question where the he ell is screen record damn ! I don’t think this update came with it. You press the HOME and UP Volume at the same time and it’s supposed to put an icon in the notification bar that shows it’s recording, but I can’t get it to come up. Also…..software still shows at 4.1.1, not 4.1.2. So much for my short-lived exuberance….But at least I’ve got Multi-Window !! I found this (http://support.t-mobile.com/message/198535#198535), which apparently says it’s NOT available due to copyright issues? Hmmmm…..maybe time to look at XDA-DEVELOPERS, and see what’s really going on. If it’s a CR issue…it’s pretty much a goner, unless someone acquires the right libraries, wires them up, and cooks a ROM for it that includes it. If Samsung has/is pulled/pulling the feature…doubtful it’ll make it into our hands. C’est la vie. To take a screen shot on the Note 2 you need to go into settings > Motion and make sure it’s enabled. then to do screen shot you must use the side of your hand and swipe left to right or vice versa.. oh and by the way, this feature came on the phone out of the box. He wasn’t talking about screen shots, he was talking about screen record. This was an advertised feature of this phone, and is in at least some international versions. Lets you record a video of what is on your screen. Are you sure your not thinking about the ability to record yourself drawing/ taking notes in S-Note? I use this feature alot when I’m with my little sister. I just got my update this morning and i love it. Ive been showing it off to all of my co-workers making them jealous. I wish though we could use it for all apps that would be the ultimate thing. Any recommendations for a stable, easy to follow root method? Also, do you only need to root it to add more apps to multi-window, or do you also need to install a custom ROM to do it? Root with stock rom, and you are done. Google root galaxy note and you will see the website. Why cant I make it work? Its saying my phone is modified but its not. Never been rooted. P lease help! Factory reset it, then you should be okay. But be sure to back up first. Works like a charm!!! Finally! Can someone please help me? I’m trying to update but it’s saying my phone is modified. It’s never been modified. I bought it brand new and wouldn’t know how to modify it if I wanted. Please help. Now THIS….is why I bought this phone……Finally….TMo has a winner on it’s hands…..now only if they’d made it a little more affordable to begin with (You know I was gonna say it, and you know I’m right. So go on and be haters if you must.). The update went smoothly and the multi window worked for a brief time but now when I long press the back button nothing happens. The build number shows the latest update installed properly. Anyone else experiencing the same issue? Long pressing the back button should bring up the dock, then it “hides” either on the bottom or top. Long pressing the back button again makes the whole thing go away. Check to see if you have a round tab on the bottom or left side of your screen. Thank you panther for taking the time to help. I installed for the fixes. 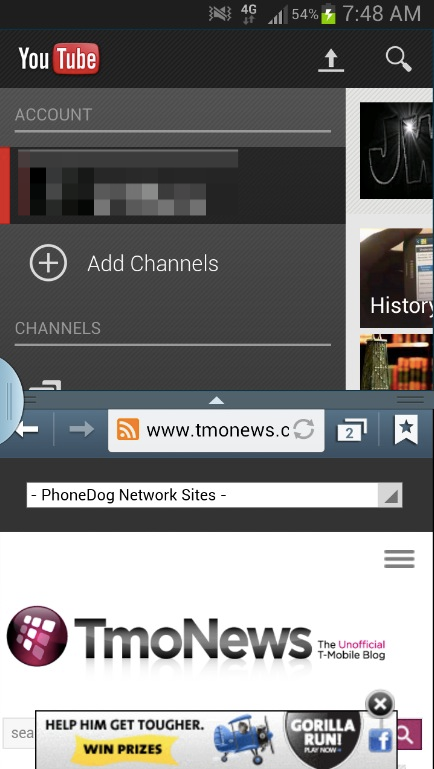 The Multi-windows is alright, but since most apps aren’t compatible it’s kind of useless to me. Also, with this update (I’m rooted) I had several apps installed that I can’t find to uninstall. This is annoying. Meh, I’m sure they’ll release another update early next year. Maybe it’ll be up to a new Android. Key Lime Pie anyone? Here’s to hoping. Very nice feature! My only very minor issue is that it appears to have replaced the “Sync” option on my notification bar. panel………. so now i need another widget………. It’s the quick glance screen. It’s a option under “motion” in settings.